I am not really a health freak but I do plan my meals properly…a well balanced diet and everything in moderation is my motto in life. I visited an organic shop the other day and had bought some dried organic noodles made of different ingredients and this oats cereal soy noodles looks good…has lots of nutritional values . 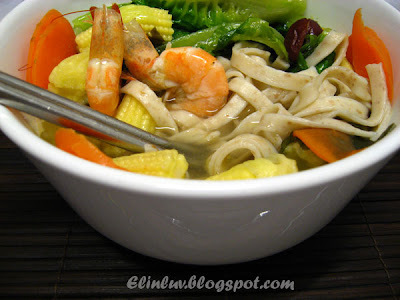 I cooked them for dinner last night and wow…it did taste good….texture is exactly like the fettucine and has a subtle cereal and soy fragrance mmmm I will definitely buy more in my next trip there :) It is a versatile noodles..you can have them in soup or fry them with veggies and meat fillets/shrimps. It will taste just as good. But for me, I cooked a konbu soup base with lots colorful veggies, like the carrot, fresh baby corns, wakame, curly lettuce/ little gem and on second thoughtsadded some shrimps to the soup for a more balanced diet. It is indeed a delicious bowl of noodle soup….serve with a plate of chopped chilli padi and fresh garlic with light soy sauce…Mama mia ! 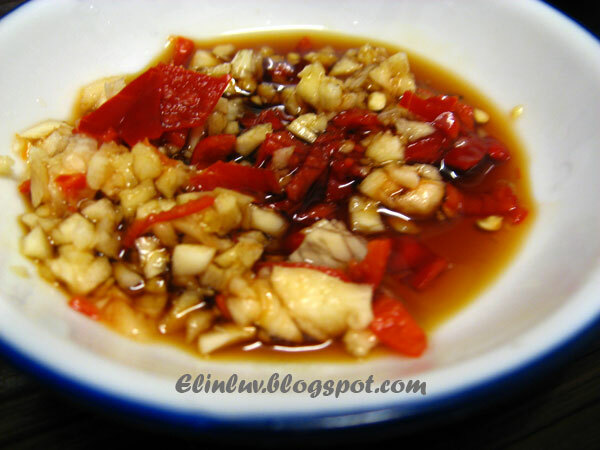 how could one go without this flavorful fresh chilli dipping . It is a must in my family to have this chilli garlic sauce when eating a bowl of soup noodle. A delish and a well balanced one dish meal ! 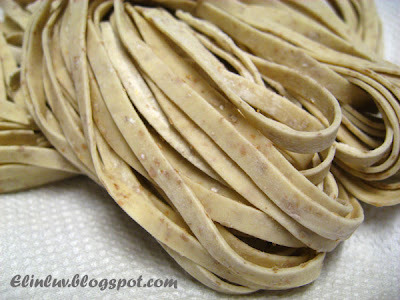 Cook the organic noodles in hot boiling water till al dente. 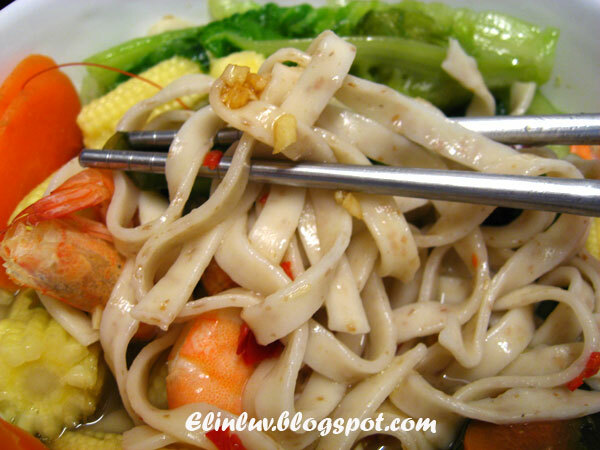 Strained and arrange noodles in a noodle bowl. Leave aside and meanwhile boil 3 bowls of water in a soup pan under medium heat. When water boils add in konbu and Chinese red dates and boils under low heat for 25 minutes until you can sniff in the wonderful aroma of the konbu. Add in all the veggies, wakame and shrimps. When the shrimps turned red, add in sea salt. Boil for another 3 minutes. 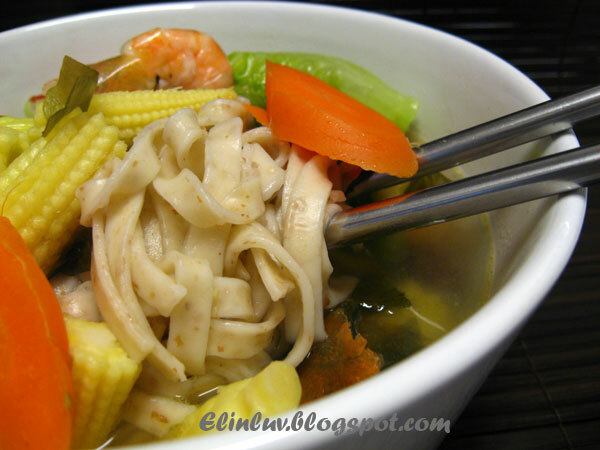 Off the heat and pour the soup over the cooked noodles and serve hot with the chilli garlic sauce. I saw these noodles being sold and was tempted to buy them. Do they taste good? It looks very healthy with the soup and all. I want some!! That's a very healthy meal. I would love that. First time I hear of soya oat noodles. Should taste very nice. 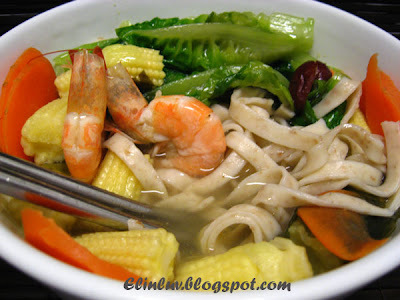 i miss this kinda clear soup !!! Yumboz! 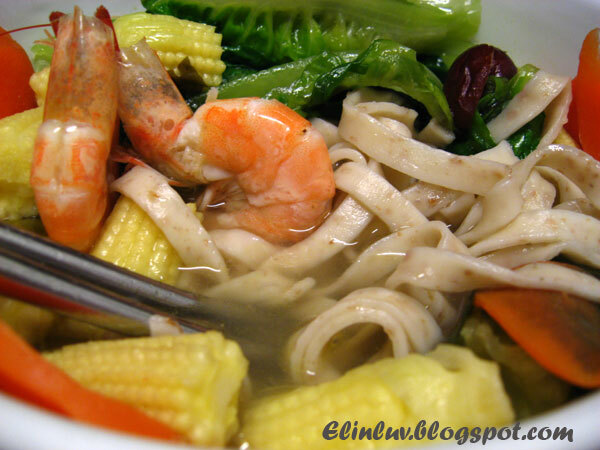 Very nice with a clear soup base and it is definitely a healthy meal. What a terrific, healthy meal. Your pictures are fantastic. Hi STP...really! Next time u come to Ipoh, I will buy some for you... you want to slim down or not ? LOL! Hi Mary...yup it is good especially with a nice yummy soup with lots of greens :) and not to forgive with the chilli sauce ...yumm!